We are enlisted amongst the leading names in the industry offering our clients wide range of Rotary Breaker . From our wide consignment, we are affianced in supplying Rotary Breaker. 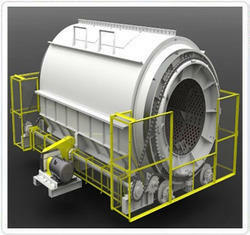 applicable for coal and pet cocke crushing < 6mm for boiler feed. fedd size up to 400mm cube . capacity 60 to 100 tph. - A rotary breaker sprockets engage chain drives in power transmission and conveyor systems, though sprockets can engage any perforated material. - Single piece 12 feet steel cast sprocket duly flame hardened teeth. We are a top-notch organization, engaged in providing Rotary Breaker. The Rotary Breaker is manufactured by 50mm hole size of Perforated Liners along with lifters assembled within a frame structure. The base frame is mounted on Anti Vibrating pads & fitted with thrust wheels which gives supports to the Rotary Breaker movement. The speed is controlled by VFD . As per the distinguished and changing requirements of our customers, we have come up with a huge collection of Rotary Breaker . We are counted as one of the famous organizations for offering a premium quality collection of Rotary Breaker . Banking on our enriched industry experience, we are able to supply Rotary Breaker. We are amongst the most reputed names in the industry, offering Rotary Breaker. In order to meet excellent quality standards, we are supplying Rotary Breaker. Alliance Heavy Infra Pvt. Ltd.